What happens on those days when you don’t have time to cook or you just don’t feel like going to a lot of trouble? I know sometimes at our house and maybe at yours too we will get takeout or even go out to eat, but there are also those days where that’s really not what you want either. Why consume all those calories or why spend all that money? If you’re like me you probably have a couple of go-to recipes that you will use on the days just like that. Something your family will eat, something you have the ingredients for and something that’s pretty simple. 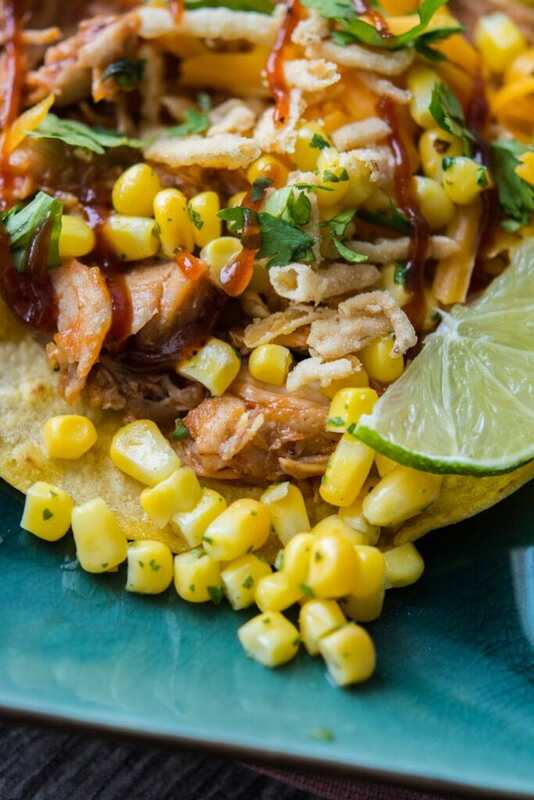 If I were into betting, I place my money on the fact that many of you have taco night at your house at least occasionally for this very reason. 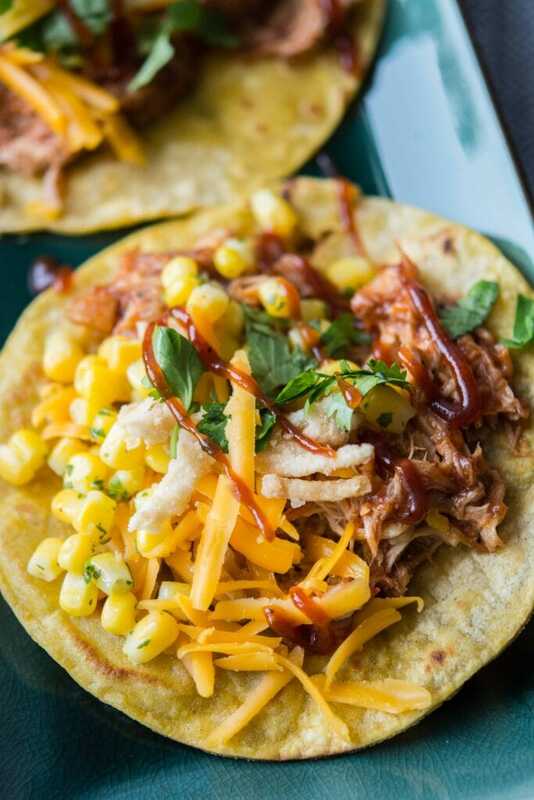 But since I can almost hear the disappointment of my family at yet another boring taco night, I decided to think outside the box to find something just as easy but with a totally new spin, and in the end we all agreed, Slow Cooker BBQ Chicken Tacos are a hit! 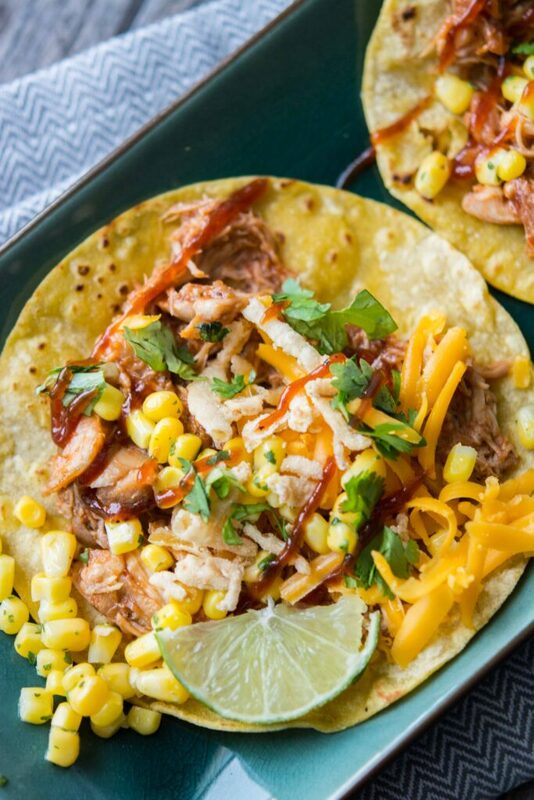 With only three ingredients to get going in the slow cooker you will have time to start this dinner even on days when you have to rush out the door. 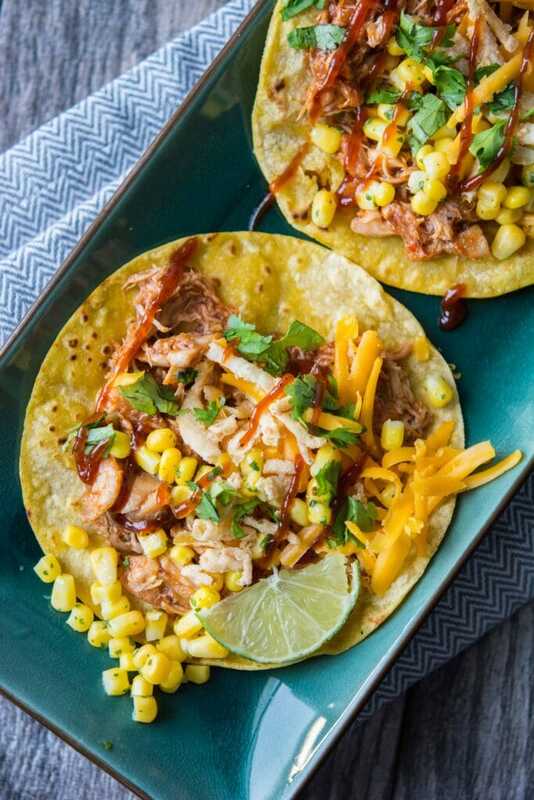 Chicken, seasoning and BBQ sauce may sound unusual for a taco base, but hey, isn’t different what we’re going for here?! 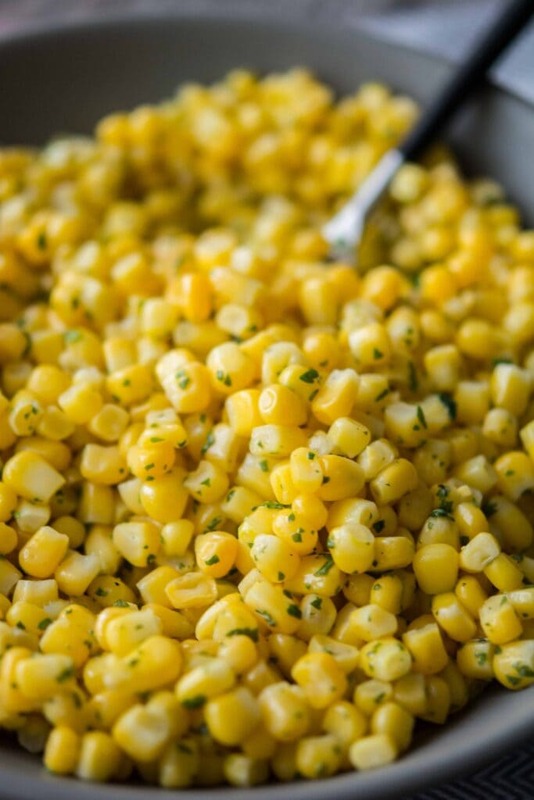 Add to that a simple corn salsa that you can make with a bag of frozen corn and some items from your pantry. Add a little squeeze of fresh lime juice or keep one of those little bottles on hand for days such as this and you are totally set. We served ours up on corn tortillas that I heated in the the skillet along with some crispy fried onions. I just used the kind that come in a can… you know I like things as homemade as possible but sometimes you’ve just got to throw in a little cheat. I’m going to count it as a win since we are still way better off than eating drive-thru fries. 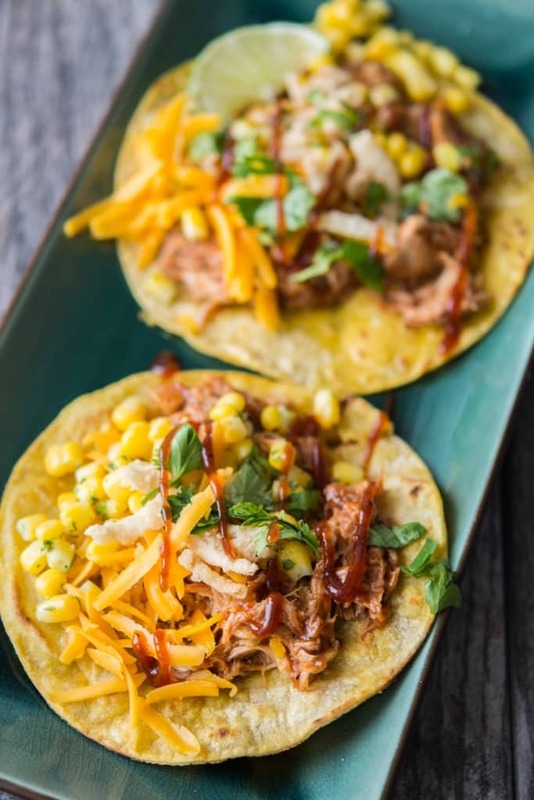 Give this recipe a try and let me know if it helps spice up taco-night at your house!! I cooked this on low for 7 hours in my 4 quart multi cooker. 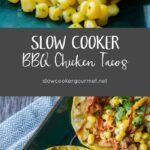 I need to start putting my crockpot to good use with your fabulous recipes!